Soooooo we got some new neighbors. And boy are they cute. And young. And newlyweds. At first we were able to bond over our similar interests of grilling and fishing but then we started noticing strange things. For example, in the mornings when I drag myself out to the end of the driveway in my bathrobe, bed head, and no makeup to put the kids on the bus I have started seeing them. Awake. In gym clothes. Both walking their twin huskies AT 6:15 IN THE DANG MORNING!! “Something seems off about them,” I think to myself. Being the proper southern couple that we are we shouted our congratulations to them as they sped away to enjoy their wedding reception. And we were left to duke it out over who took out the trash last or who has to pick up the kids this week. Now I realize I am no longer young. Or cute. Or a newlywed. I realize that I perhaps-maybe-a little bit have become jaded by the years. So I take a beat and realize that all these transgressions are ultimately forgivable. And then October came. And they decorated the yard. For Halloween. Now I’m not talking about a pot of mums and a hay bale. Not even just a scarecrow. 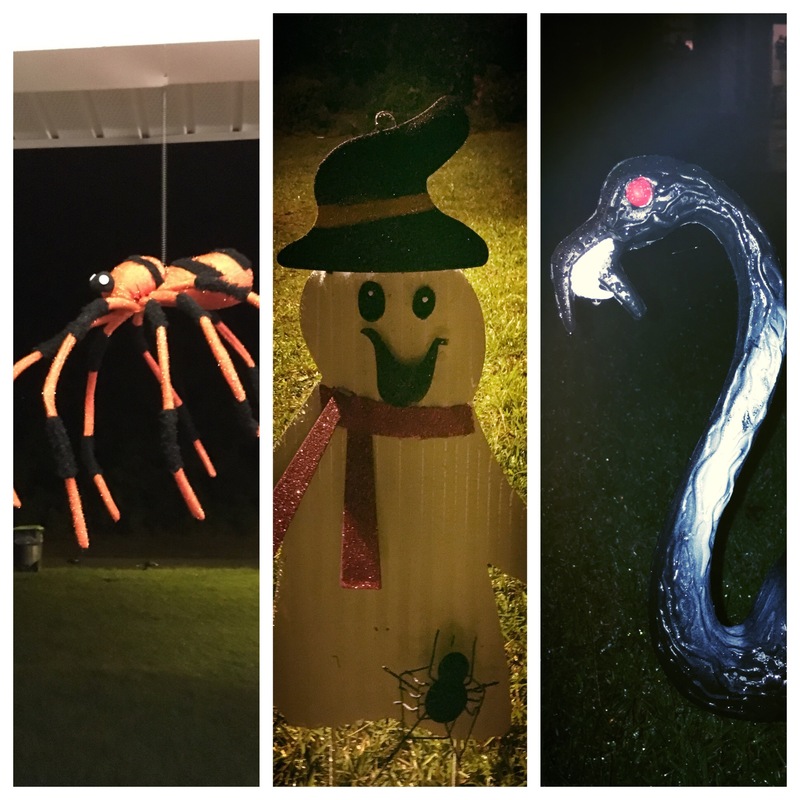 These people have swathed a giant tree in their front yard with fake spiderwebs which of course host a larger-than-life spider hanging from the tree. They have replaced all outdoor lightbulbs with orange tinted bulbs to give their house a “spooky” glow. But the worst? They have two skeletons accompanied (obviously) by two skeleton dogs (to mimic their two perfect huskies) that adorn the flower bed. But it gets worse. Every day or two they reposition the skeletons to act out different scenes. The first they were digging graves while the dogs howled in the background. Then they were lifting weights (I dunno go figure). Then they were acting out a marriage proposal whilst the dogs sat patiently waiting for her to say “YES!” Currently they have installed a hammock in the front yard and one skeleton whimsically pushes the other and the dog skeletons frolic in the yard. Now again, as annoying as this seems I was willing to overlook. Until the day my children began to take notice of the shenanigans at the new neighbors’ house. At this point I began fielding a barrage of questions. You see my predicament here. So one Saturday afternoon I sucked it up and piled all three of them in the Suburban and drove them to Party City. We bought 2 “vampire flamingos” that now sit near my mailbox. One tin ghost cutout that really looks more like a snowman. And one hanging spider that now hangs over my porch. I hesitate to show you THEIR yard for fear they may one day stumble upon this blog and learn my true feelings. So PSA to my new neighbors: Please slow your roll. You’re making me look bad. Can’t wait to hear what Christmas brings. You have an amazing gift with words and you keep me laughing. Your words can reach right down into the pits of our darkest emotions and reveal them so that that don’t seem so bad. Thanks. Well God bless those people who have freshness, energy, and enthusiasm! But you, my dear, have steadfastness, fortitude, and wisdom beyond your years! And you may not be that young, but you are still “young” compared to many of us…and you are still very cute!! !